The first task we set to do with the robot is grow yeast cells for experiments. This sounds easy? No? To understand the issue. Lets review the typical yeast life cycle. Suppose you pick a small number of yeasts from a colony or a saturated culture and put in a fresh "rich" media with glucose (sugar). Moreover, suppose that the media is kept in nice temperature (yeast like 30C) and shaken to make sure yeast cells and nutrients keep mixing. Initially it will take the yeast cells time to realize that they are not in the nutrient-poor environment they were in. They will revitalize themselves and prepare to grow. This phase is called lag phase. During this phase the number of yeast cells will not change. Once out of lag phase the yeast will start to grow on glucose. They will work hard to use this rich source of energy to grow as fast as possible. A typical yeast cell will divide every 90-120 min (depending on the exact conditions and temperature). This period is called doubling time as the number of yeast will double every fixed period. During this phase the yeast will experience exponential growth. For this reason this is known either as exponential phase or log phase (since it looks linear in logarithmic scale). After a while the yeast will start exhausting the sugar. If this was bacteria they will stop growing. But yeast has another trick up their sleeve. They switch from using sugar as fuel to using ethanol. During the fast growth phase the yeast use the glucose in a fast way by fermenting it to ethanol. This is what in human metabolism is known as anaerobic metabolism as it does not require oxygen. In nature this trick allows yeast to outgrow the competition (fast growth) and also kill it (by increasing ethanol concentration). Humans learned long time ago to use this property of yeasts to make alcoholic beverages. Returning to the yeast growth, the switch from glucose to ethanol is called the diauxic shift --- the yeast will go through it once it can no longer import glucose from the environment. Ethanol can be used for aerobic metabolism (or respiration), but requires more work to extract energy from it. As a result the yeast will grow slower. They still grow exponentially but the doubling time is much longer. This phase is often referred to as saturated or early stationary phase although these description are inaccurate as the yeast still grows. After a while (and this can take much longer), the ethanol reserves are consumed, and the yeast stops growing and enters in to stationary phase. The cells prepare for nutritional hardship and reduce their activity. 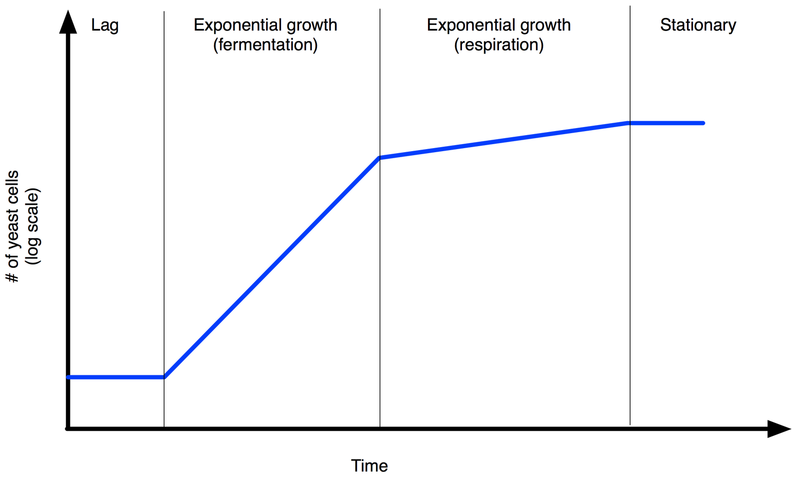 For our experiment we want to take yeasts in the middle of the fast growing exponential phase. Moreover, to make sure that the yeast forgot its history, we want to make sure that there were several (>3) cell divisions since the lag phase. This means that we need to yeast to multiply itself by at least 8-fold from the initial amount. Moreover, we want to make sure the yeast do not come close to diauxic shift, as this stage results in major changes in the yeast metabolism. This means avoiding over-crowded situation. Finally, we also want to ensure that we have sufficient number of cells to work with, so we do not want under-crowded cells either. Sounds easy. If the lag phase is 60min and doubling time is say 90min, then we need 330min (5 1/2 hours) to grow the yeast. Calculate the desired amount at the end and seed the culture with 1/8th of that. The problem is that we want to work with many strains of yeast. In fact, we want to grow 96 strains in one plate. Each strain has different lag time and doubling time. This means that while one strain has 90min doubling time, another might have 150min doubling time. This means that for the latter strain we need 450min to get 3 doubling (8-fold increase), but by then the fast strain has two more doublings and has grown by 32-fold from the original number of cells. 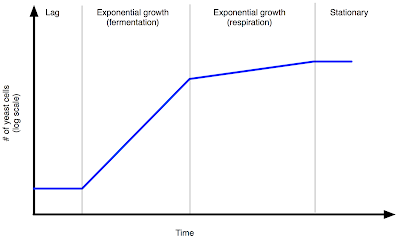 Due to the exponential growth, small difference in growth rate can lead to dramatic differences in cell concentration. So, how do we deal with the problem? Ideally, we can measure the relevant times for each strain and then plan the initial seeding to get things right. In fact, this is what we do, but using a robot. During the last two weeks, Assaf and Avital developed a robotic protocol that grows the plate of yeast for 20 hours. Every half hour the robot took the plate out of the incubator, and put into a plate reader (spectrophotometer for plates) that measures the optical density (roughly equivalent to number of cells). After this incubation time most wells were past the diauxic shift. The program then used the plate to seed a new plate and again monitored growth for several hours. At this point Assaf and Avital's program computed what dillution it need to perform to each well to ensure that at the planned target time the cells will rich a desired density. The robot then applied a customized dilution step for each well. At the end of this procedure we had a plate with 96 strains (with very different growth characteristics) all in roughly the same density. To our surprise/relief/joy the robot did all of this without a fault. The end result can be seen like this. In this graph OD corresponds to yeast density, and each curve describe the density in one well on the plate. You can see the yeasts growing fast and then slowing down. You can also see the two dilution steps (the first dramatic one and then the "correction" step). Most importantly you can appreciate that in the end all the wells are fairly close to each other in density. For some reason the empty wells (that do not grow :-) misbehave after the dilution step. Do not that before the final dilution there is a large variability in the density and that it mostly removed by the program. And so now we can start doing experiment with tightly controlled yeast growth. Yey! Cool fact on Diauxic shift. The blog aims to describe the progress of building a new molecular biology lab. I am a computer scientist who slowly shifted into biology until the stage where I decided to start my own experimental lab. My group and I went through many obstacles, some of which I describe in these posts. When I started this blog we moved into a temporary space in which we started doing science. Now we have our permanent lab and can focus more of our time on the science. In this blog we will try to describe the steps as we go through them, as they represent an exciting time for us. You can read more about us, and also see a timeline of major events prior to the beginning of this Blog.